A reader sent along a few pictures of the aftermath of Jason Kidd's wild Saturday night/early Sunday morning. Initially we were excited because maybe they would show Kidd's car at the scene and other interesting aspects. While it certainly appears to be the scene—in the last picture in the gallery you can see the the street sign for Little Cobb Rd., listed in the original article as an intersecting road in the accident— there is no picture, unfortunately, of Jason Kidd's car. 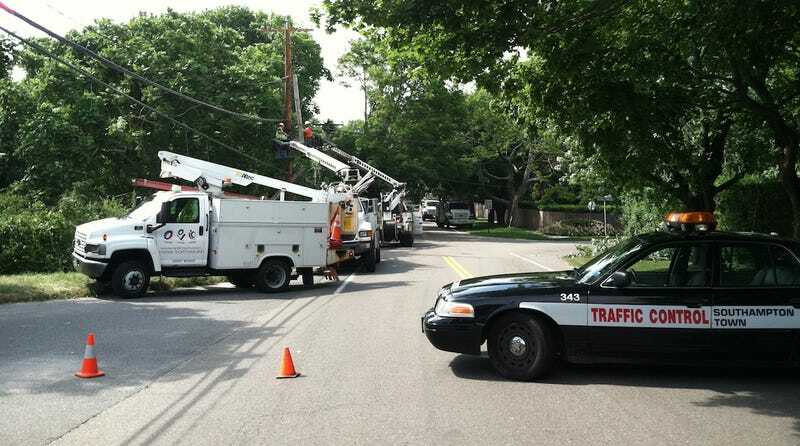 However, there are several pictures of Optimum trucks and Optimum workers at the scene, repairing the pole Kidd allegedly bounced his Cadillac off. For those not familiar with New York Metropolitan area cable politics, Optimum is a division of Cablevision, whose president and CEO is New York Knicks owner James Dolan. "all the cable phone and Internet on Mill Creek Close and parts of Cobb and Little Cobb rd"
Maybe bring in some coffee and donuts or something your first day, Jason. Click to enlarge and you can see the street name.